I've been in a bit of a slowdown this past month so I've decided that it's time for me to kick it up a notch here. And by that I mean I've resumed work of the alphabet. 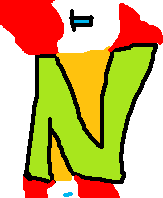 I drew the N without really caring much. I've started on it a few times before but never finished it so I didn't really think on it too much. Then I turned my head a bit and there is was. The two beaks which would allow the letter to be with the chicken.